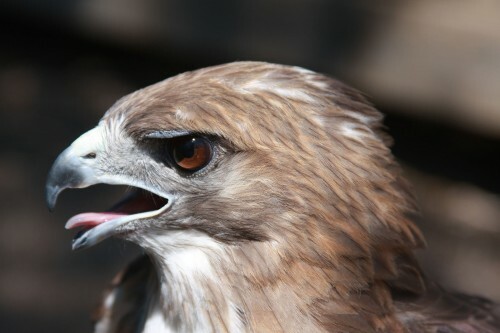 Meet Quemado, one of our senior Red-tailed Hawks! /Hawks Aloft Inc.
Meet Quemado, one of our senior Red-tailed Hawks! All of our educational ambassadors have some injury that permanently prevents their release to the wild. Quemado, which means ‘burned’ in Spanish, suffered an electrocution injury when, as a hatch year fledgling in 1995, he was chased into a live power line. Apparently, a murder of crows was hellbent on dispatching the young bird. A concerned citizen watched the attack and was there to pick up the critically injured young red-tail. He was taken immediately to wildlife rehabilitator, Shirley Kendall, in Corrales, which was very fortunate for the bird. Electrocution injuries are almost always fatal due to the severe internal burns that occur along the path of the electric charge. Although the external entrance and exit wounds might appear to be minor and the the injured bird might seem to be recovering, once the dead tissue begins sloughing off, gangrene usually sets in. In Quemado’s case, he survived thanks to a quick capture and the quality of the care provided. Eventually, the metacarpal on his left wing and the fourth toe on his right foot were removed due to damage from the electrical burn. Quemado’s been with us now for 12 years, a fully mature, male Red-tailed Hawk. He is used mostly for adult programs, especially for corporate programs in the electric utility industry. He’s a much-loved and greatly appreciated member of our education team! He resides in a 20′ long flight cage with our female red-tail, Jamaica, who was shot (but that’s another story!). The vocal pair alert us to any and all humans that intrude upon their space, which is the back yard of Gail’s home.